In the summer of 2018, I backpacked to Cathedral Lake in the Elk Mountains near Aspen, CO. I had two objectives: climb 13er Cathedral Peak (featured at center) and photograph sunrise from there, and photograph the Perseid Meteor Shower. Not easy to combine a night photography goal, climbing a mountain, and photographing sunrise in one day, but I managed to pull it off. I'll sleep when I'm dead. Despite the haze in the night sky from the California fires, this was the best Perseid shower I can remember shooting. There were huge streaks of light on a consistent basis. 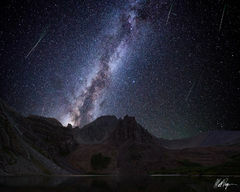 I was very pleased and just loved laying on my back next to the lake to watch the meteors rain down. It was a fabulous night of star-gazing and meteor watching! It was VERY dark, so I processed it darkly. Out of 413 exposures I shot over the course of several hours during the Perseid Meteor shower, I combined multiple (19) exposures to bring forward all of the meteors I was able to capture as well as the Milky Way. I then combined this with my foreground shot which was exposed for much longer (but not as long as I wanted - I accidentally left my intervalometer at home and forgot to download the PlayMemories app on my phone, so I hand-held the button down).